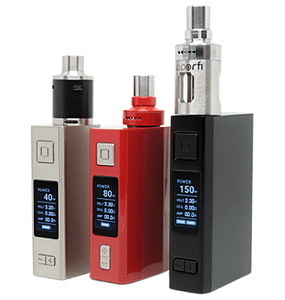 VaporFi continues to innovate and they recently introduced two new lines to their box mod family and revamped their original line, the VOX box mods. We’ve reviewed a number of VaporFi VOX mods, including the VOX II, VOX Mini, VOX TC 50, VOX TC 60. 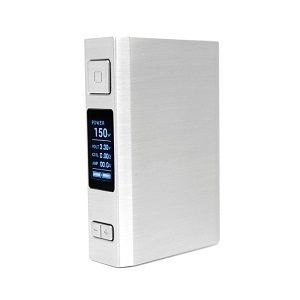 The two new lines of box mods are the VAIO and the VEX lines. All three lines feature temperature control functionality. The VAIO mods are all-in-one devices with 3.5 ml built in tanks. The VEX line features a 75 watt and 150 watt model. 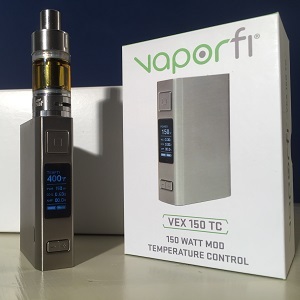 VaporFi sent one of their VEX 150 TC mods, their most powerful device to date, for Seven Report to review. The VEX 150 TC is powered by two external 18650 batteries (not included). The battery door has a spring loaded latch, VaporFi refers to it as “bottom door slip.” Positive and negative signs are etched into the door to make it obvious which way to insert the batteries. You can charge the batteries while they’re still in the device via the micro USB port on the side of the mod and the included charging cable. And you can continue to vape while charging, though it will slow down the charging process. The menu system also allows you to switch between variable wattage and temperature controls and to select the type of coil you’re using in temperature control mode. The VEX 150 TC will fire Kanthal coils in wattage mode with a resistance range of 0.1 – 3.5 ohm. In temperature control mode it will fire Nickel 200, Titanium or Stainless Steel coils with a resistance range of 0.05 – 1.5 ohm. I attached an Eleaf MELO 2 tank with a Titanium coil to the VaporFi VEX 150 TC and set the mode to Temperature TI and the temperature to 400° F. The VEX fired immediately and vapor production, even at that relatively low temp setting, was more than satisfactory. I upped the temperature to 430° F and then to 450° F. With each increase in temperature vapor and flavor production increased as did the warmth of the vapor itself. I’m very impressed with this initial performance of the VEX 150 TC. I can’t wait to try it with a SMOK TFV8 tank attached. I’ll be using the VaporFi VEX 150 TC extensively for the next week or two and then coming back with a full, in-depth review. If you follow Seven Report on Twitter or Facebook you’ll find out that way when the review is live. 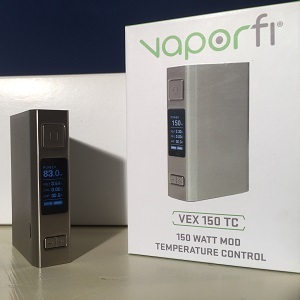 Thanks to VaporFi for providing the VEX 150 TC for review. 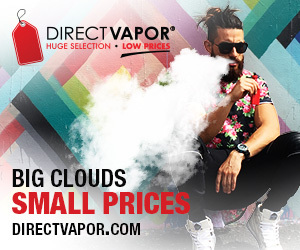 VaporFi is a long time review product supplier and advertiser. Find out more about the VEX 150 TC and order one here.